Photographer Robert T McVay captured a fan trip with Pacific Electric no. 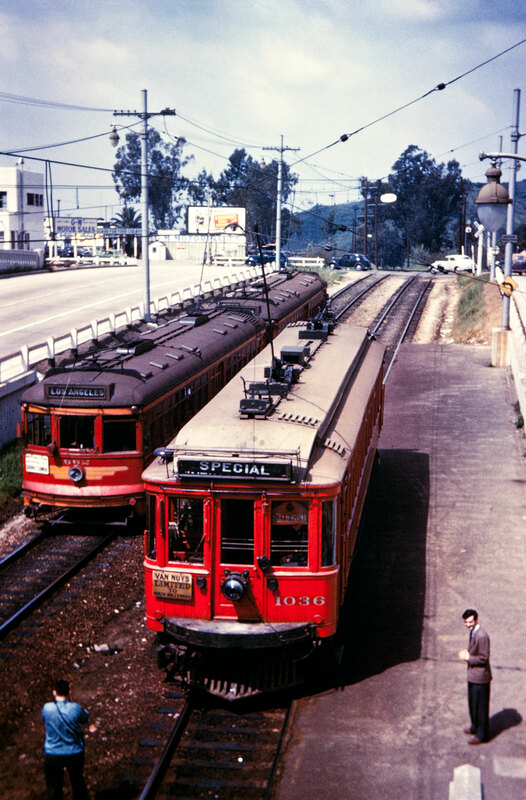 1036 on March 23, 1947, at this stop at Barham Boulevard at the Hollywood Freeway. Pacific Electric no. 662 seems to be on regular service and is just passing through the scene. What is unique about this photo is in the distance is the END of the Hollywood Freeway, the next segment of the freeway is yet to be built. All traffic turns west to re-join Ventura Blvd. PE 1036, my favorite interurban. I like those “Hollywood” cars, too.